Searching for Snowy Owls /Hawks Aloft Inc. I finished up my morning surveys in the Albuquerque bosque on Tuesday, January 10. Fellow crazy birder, Sami Sanborn, picked me up at the southernmost end of the route, driving her little Honda sedan. Hastening to my home in Rio Rancho, we loaded up my gear and headed north, reaching my sister’s home in Boulder, CO right about dinnertime. With clear skies and dry roads the drive up was a breeze! We even spotted a buteo or two on the drive up. Sadly, the weatherman offered only a dire forecast for the following day, snow and high winds. So it was that our spirits were high when we arose the morning of January 11, 2012 to light clouds and, best of all, NO wind! 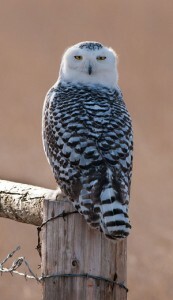 We had begun to hear reports of Snowy Owls appearing far south of their normal Arctic range in early December, 2011. 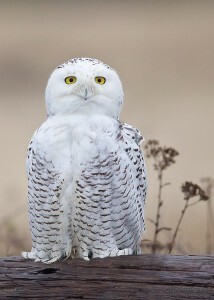 By mid-month reports blossomed from throughout the northern tier of states while both the numbers of the iconic white owls and the locations in which they appeared continued to increase into January, a full-blown irruption, the likes of which have occurred only every 30-40 years. It wasn’t long before David Powell headed north to Montana in a quest to capture a Snowy via camera lens. Reports of two Snowy Owls in the Denver metropolitan area began to circulate in early January, much closer to home. Photographer, Doug Brown and I discussed his desire to make a northward dash to photograph the birds, but with only one and possibly two owls reported from Colorado it seemed a risky venture. Doug opted to look for other locations that might provide greater numbers of owl sightings for his photographic venture. 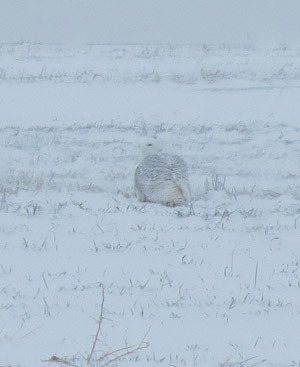 I just couldn’t stand to stay at home and miss what might possibly be my only chance to ever see the magnificent Snowy Owl, the largest and heaviest of the North American Owls. Sami, who is usually up for any adventure, quickly agreed, and our plan was hatched. On January 11, as the sky began to lighten, the trees began to sway and tiny little, white flakes wafted their way downward. Surely, the weather would be wrong! By the time we left my sister’s place headed to Brighton, CO, two inches had already fallen, the winds were howling, and vehicle accidents abounded. So, we drove slowly and hoped for the best. I was wishing that we had driven my 4WD Ford Explorer instead of a 2WD sedan, good mileage be damned! Owl experts say the phenomenon is likely linked to lemmings, a rodent that accounts for 90 percent of the diet of Snowy Owls during the summer breeding months, although the owls also prey on a host of other animals, from voles to geese. An especially plentiful supply of lemmings last season likely led to a population boom among owls that resulted in each breeding pair hatching as many as seven offspring. That compares to a typical clutch size of no more than two, according to Holt. Greater competition this year for food in the Far North by the booming bird population may have then driven mostly younger, female owls much farther south than normal. By the time we reached the designated agricultural field in the flats northeast of Barr Lake State Park near Brighton, the snow was blowing sideways and the term “limited visibility” was a gross understatement. Finding a white owl in whiteout conditions would be an extreme undertaking! So, we drove 100 yards and stopped and scanned, then repeated the process. Again. And, again. At about the fifth stop, as I was trying to make something out of nothing in the blinding whiteness in which we were surrounded, a lump appeared. Looking closer, I thought I just might be able to turn it into an owl – a big, white one! Or, instead, I might just be imagining owlish fantasies. But, then it turned, picked up one giant white foot and scratched its head! Our quest was a success. Shouts of joy erupted from inside the warmth of the sedan as we both positioned ourselves on the same side of the car. Rolling down the car windows was a mistake as the snow just moved right on into the car with us. Finally, we figured out a way to position the spotting scope inside the car so we could look through the windows at the owl. Although the weather was extreme for we human types, this particular bird acted like it was a sunny day in the park, preening, scratching, and looking remarkably unconcerned. Eventually, it flew off to parts unseen, beyond the range of our limited visibility. We returned that afternoon, after a hearty celebratory lunch, and following the demise of the morning’s furious storm, and relocated the Snowy Owl amid brilliant blue skies, just before my sister drove up to get her look at the bird. Accounts of emaciated owls at some sites, including a food-starved bird that dropped dead in a farmer’s field in Wisconsin, suggest this irruption has a darker side. 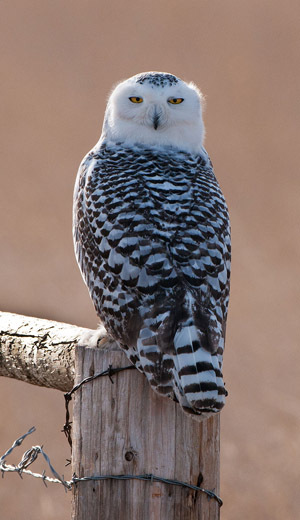 And, the Snowy Owl that landed at an airport in Hawaii in November was shot and killed to avoid collisions with planes. The cause of this winter’s Snowy Owl outbreak remains largely a mystery of nature. Now, in early February, the sightings continue unabated. No one knows how long our white visitors from the north will stay. Doug Brown opted for a trip to the Olympic Peninsula where he captured some amazing imagery. As you read this, members Ed and Mary Chappelle will be winging their way to Seattle for their owl quest, Mary’s birthday present! I wish them great success. If you also decide to take a sudden northward migration, I hope that you, too, find what you are seeking.